The Nokia Lumia 925 is a subtle but meaningful update of what was - literally until a few days ago - the company's top smartphone offering. While designers and engineers were busy fixing the Lumia 920, the guys next door produced a louder bang with the Lumia 1020. Still, the Lumia 920 was in many ways the flagship that really showed the company with its best foot forward. And the Lumia 925 is a very welcome facelift, sporting a lighter, thinner aluminum frame instead of the all-polycarbonate bulk of its predecessor. The screen is of the same size and resolution, except this time around it's an AMOLED panel, which works great with the mostly black WP8 interface. It's the AMOLED screen too that takes credit for the fat loss. Other small highlights are the inclusion of an FM radio and some minor software improvements, but those will also be seeded to the Lumia 920 with a software update. When it comes to the updated chassis, the Lumia 925 refresh can be likened to BMW's M-Series - they're very similar to their non-M-powered brethren when it comes to design, but the updated body is a definite improvement over the original. In terms of what goes under the hood though, these are two different schools of thought. 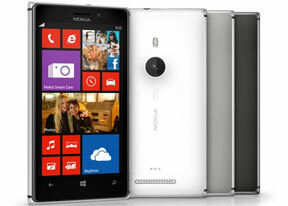 Because the 925 is basically the same package as the the Lumia 920. The Lumia 925 is all about the looks and feel - the updated body is a definite improvement, and there's a few extra features thrown in to sweeten the pot as well. Although it may be minor, the inclusion of the thinner and, more importantly, lighter frame takes care of two of the disadvantages we listed for the Lumia 920. The chipset is the same as before and while it's not a benchmark blaster, but WP devices have consistently demonstrated they don't need too much horsepower to give a smooth ride through the UI. Of course, heavier apps may tend to load a bit slower, but lags and system freeze should be pretty much out of the question. Up next, we'll be taking a closer look at the redesigned body in our unboxing and hardware inspection. The only problem is, I cant upload or send songs through whatsapp application.